To most people today, Emile Zola isn’t even a name that they would recognize. If they do recognize it, they probably know him from Manet’s portrait of him reading at a desk with a reproduction of a Japanese samurai in the background. (Ok so that is how I was introduced to him… I like Manet leave me alone) However when Zola was alive and for some decades after he passed, he was known as a great writer who always took up the cause of the disenfranchised. He wrote about prostitutes, poor families, war injustices, and overt political commentaries on the events that were happening at the time. Zola worked tirelessly to elevate the plight of the poor Frenchman. He was a real life Atticus Finch in many ways. It is only natural that classic Hollywood would decide to make a biopic about his life. They love that overcoming obstacles and championing the disenfranchised even today. This movie is almost evenly split into two parts. The first part could be considered Zola’s origin story. He rose from abject poverty to become one of the voices of his generation and he befriended famous Frenchmen including most importantly Cezanne. As his novels became more and more popular, he began to sink into complacency. He no longer had to struggle to be heard, to pay his bills or even to find friends. He had everything he could dream of. Then the second part of the movie comes in to ruin all of this. A solider named Alfred Dreyfus enters his life. Or more accurately the wife of Alfred Dreyfus does. She pleads Zola to look at his case. He seems to have been stripped of his rank and thrown into a remote prison over something that he had no knowledge of. The corruption in the military was so rampant that each superior officer looked to cover up their actions by accusing a less senior one of the actions they themselves had done. Upon looking at this case, Zola publishes his famous column “J’Accuse” in where he accuses the French military of mass corruption. The military responds by suing Zola for libel. The last third is Zola defending himself against this strong-arm approach to silence him in the courtroom. He delivers compelling speech after compelling speech, and tries to counter act the oppressive conservative majority who disagrees with him. All the while Dreyfus is slowly rotting on a remote island being punished for something he had not done. Emile Zola is inherently a compelling person. 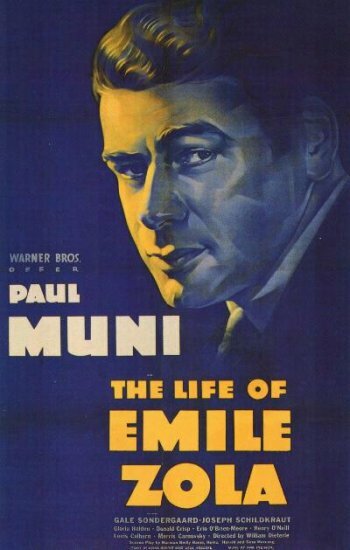 Add to that a great actor portraying him, Paul Muni, and you have an immensely watchable film. Muni is able to capture Zola’s ability to persuade a hostile mass so well that sometimes I believed he was Zola. Muni truly is a great actor that should be better understood today. On top of Muni’s performance, there is a great cast of supporting actors (including Dracula’s Daughter!) and you have a very good film indeed.